You’ll never guess what makes these Secret Sauce Chocolate Truffles so irresistible! It’s hard to go wrong with a chocolate truffle, right? But there are good chocolate truffles, and there are amazing chocolate truffles. 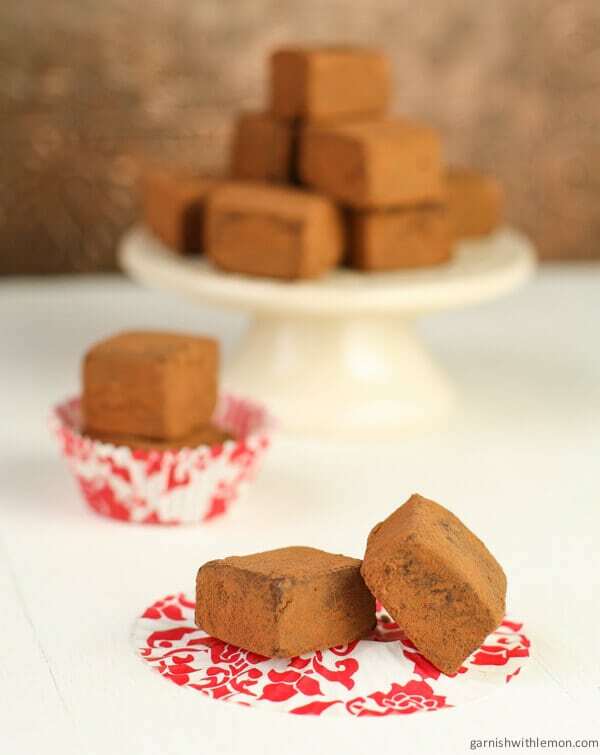 This recipe for Secret Sauce Chocolate Truffles falls in the AMAZING category. One bite and I think you’ll know why. Have you ever heard of umami? According to Wikipedia, umami can be described as the fifth taste, savory in flavor, along with sweet, sour, bitter and salty. I first heard the term used when describing certain Asian dishes, but interestingly, it also gives fantastic depth to chocolate. So what is the “secret sauce” in this truffle recipe? SOY SAUCE! Whaaaat? Chocolate and soy sauce are an unlikely pairing, but trust me on this one; you NEED to make these truffles. The flavor is just that much better with the tiny addition of soy sauce. FYI, there is no rule that says truffles need to be round. I opted to keep it simple and cut the truffles into squares straight from the pan. An 8 x 8 pan yields about 50 bite-sized truffles, which should keep you in chocolate for a few days. However if you prefer to savor your truffles (rather than inhale them like my family), they do last several weeks in the fridge and make awesome gifts for friends and family. Line the bottom of an 8 x 8 pan with a large piece of plastic wrap. It should be long enough to hang over two of the edges of the pan and cover the top of the truffles when folded. Place a small amount of water in a saucepan and bring it to a simmer. Place a heatproof bowl over the top of the pan (but don't let it touch the water). Put chocolates and heavy cream in the bowl and stir until chocolate is completely melted and mixture is smooth. Remove bowl from heat and stir in butter and soy sauce. Pour chocolate into prepared pan, cover surface of chocolate with plastic wrap that is hanging over sides of the pan and refrigerate overnight. Sift cocoa powder into a bowl. 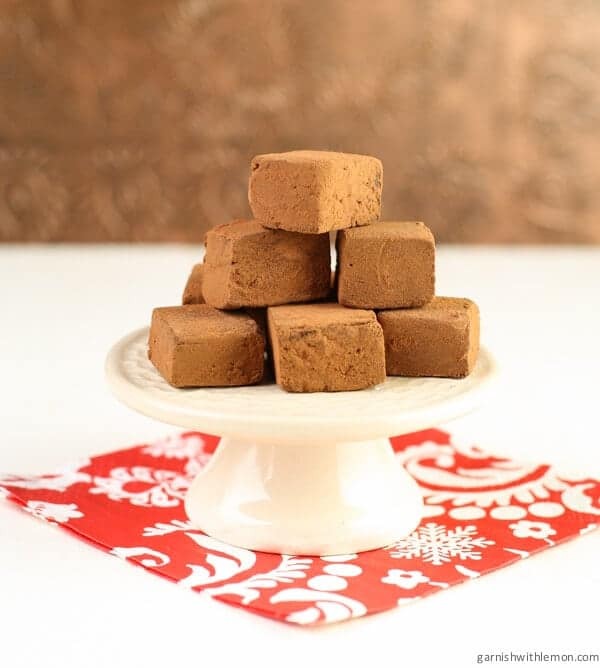 Grab a handful of truffle squares and place them in the bowl with the cocoa powder. Spoon cocoa powder over truffles and then place covered truffles in a fine mesh sieve over bowl. Shake off excess cocoa powder and place finished truffle on plate. Continue with remaining truffles. Refrigerate until ready to serve. i was surprised to see soy sauce as the secret ingredient. it sounds interesting! Me, too, Dina! But it really makes a difference. I hope you try it! I was so surprised to see the soy sauce but I could see how that would add to the flavor! Isn’t that wacky?!? But boy, does it do the trick!